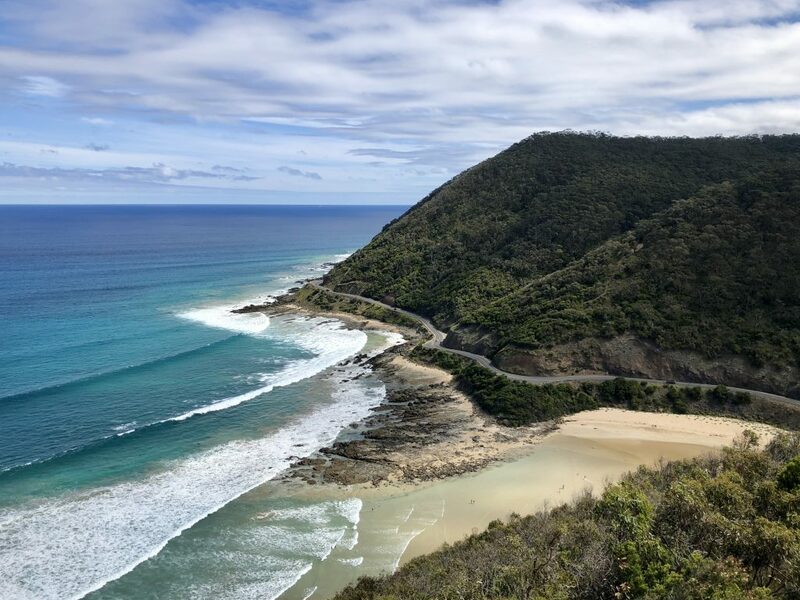 Epic views, adorable small towns and a coastline that’s truly magnificent—this is what the Great Ocean Road is all about. It’s regarded as one of the world’s most scenic coastal drives. 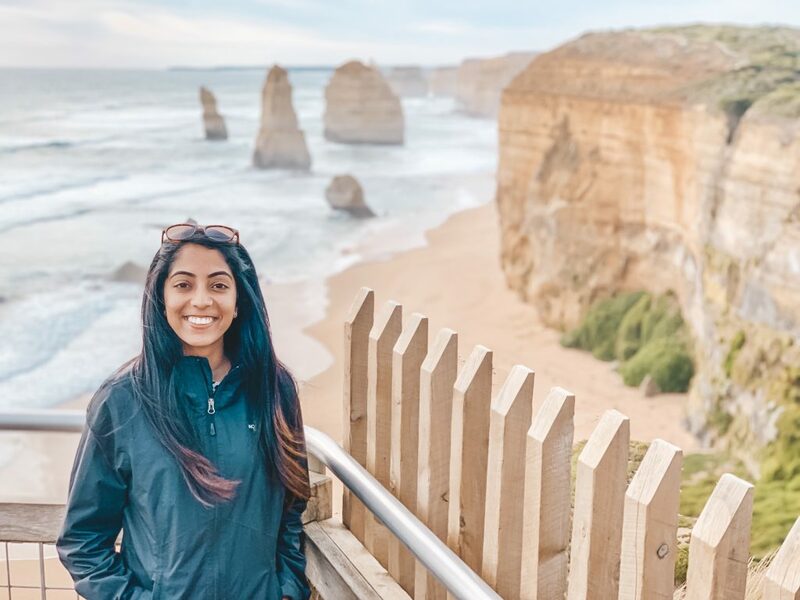 After traveling to 72 countries and seeing beautiful sights all over the world, the Great Ocean Road is truly one of a kind. Here’s what you should know before your road trip so you can get the most out of this impressive drive. I repeat.. don’t do it one day. It’s possible, but you’ll miss a lot of the highlights. 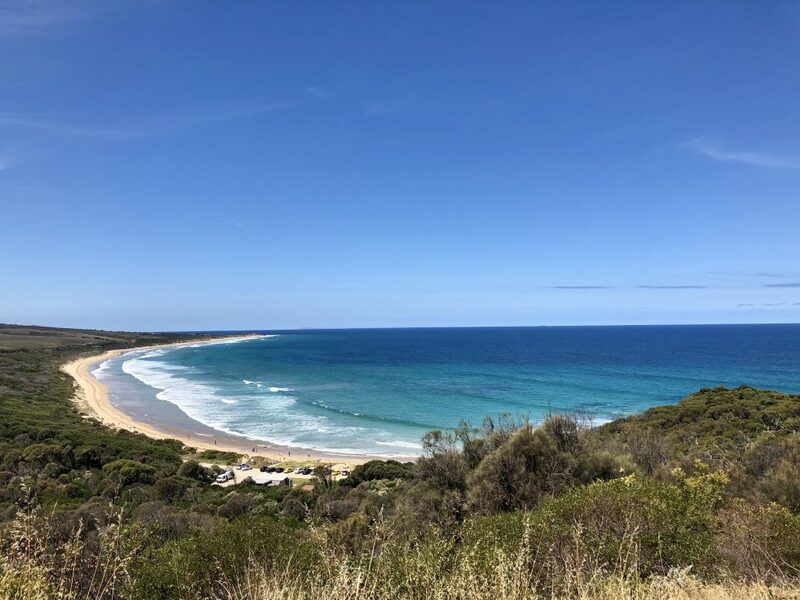 One of my biggest regrets on my Aussie adventure so far is not giving myself more time to explore this beautiful coast. We didn’t take into consideration how many breathtaking stops there are along the way. 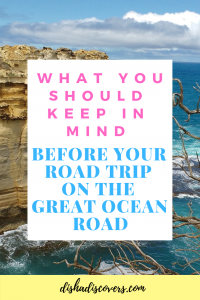 Ideally, you should give yourself a minimum of three days to explore the Great Ocean Road. 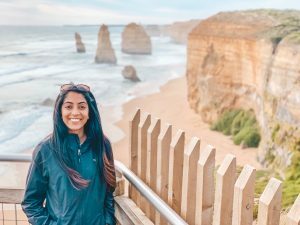 The easiest way to explore the Great Ocean Road is by renting a car. This allows you to stop wherever you want and stay there as long as you want. I don’t mean to scare you, but the road isn’t the easiest to drive on. It’s also not the hardest. It’s mostly one lane going in each direction and the lanes can get pretty narrow. Slow down for the curves and be cautious. Also, don’t forget to drive on the left side of the road. Click here for more information on the road rules. If you want to avoid the stress of driving, get a tour and kick back and relax. Make a list of everywhere you want to stop before you start your trip. This was such a last minute trip for me that I didn’t have much time to research everything beforehand. Fun fact—we were supposed to go to Brisbane and my husband decided at the last minute to do this road trip instead. I’m not complaining though. If you’re a planner like me, make a list of everything you’re interested in seeing. Don’t forget to take some detours and go off the beaten path. Pop into a local restaurant. Walk through some thorny bushes like I did to get to a deserted beach. Just kidding. Don’t walk through the bushes. But, get lost and absorb the scenery. Depending on when you go, it’s necessary to book your accommodation in advance. I went during the summer months and all of the towns were very busy. Almost 95% of the hotels we drove past had no vacancies. Book in advance so you don’t have to stress out last minute about where to stay. Sometimes, you can drive a great distance before reaching a petrol station. Make sure you fill up when you see a station so you’re not stranded on the side of the road. 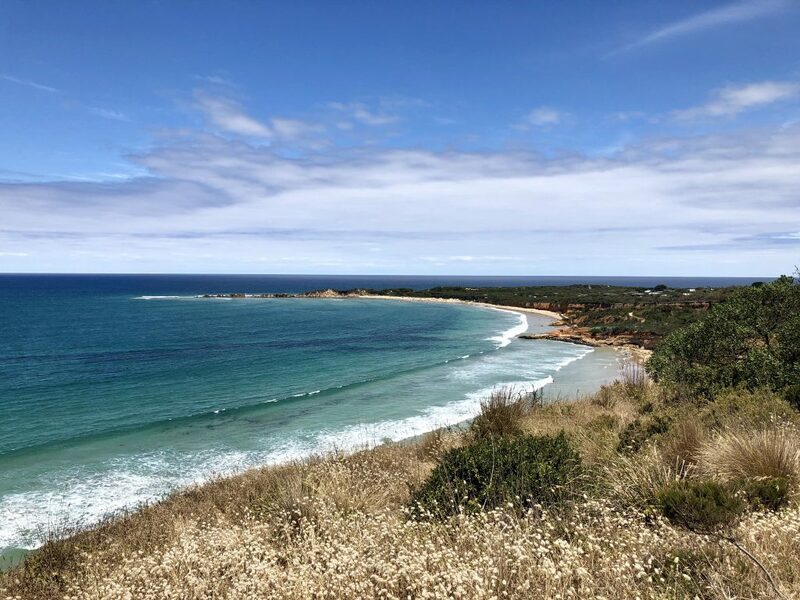 Typically, most people end their road trip along the Great Ocean Road in Warrnambool. 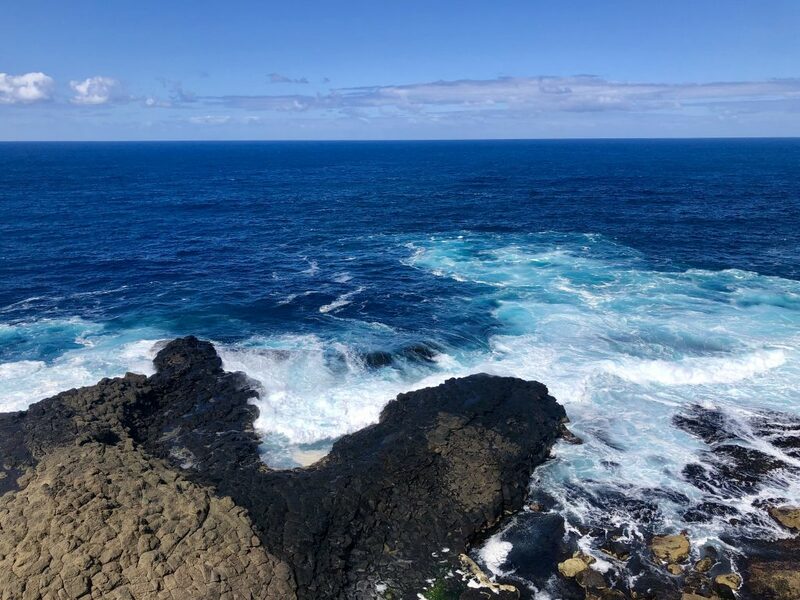 If you have time to keep driving to Portland from Warrnambool, I highly recommend that you do that. 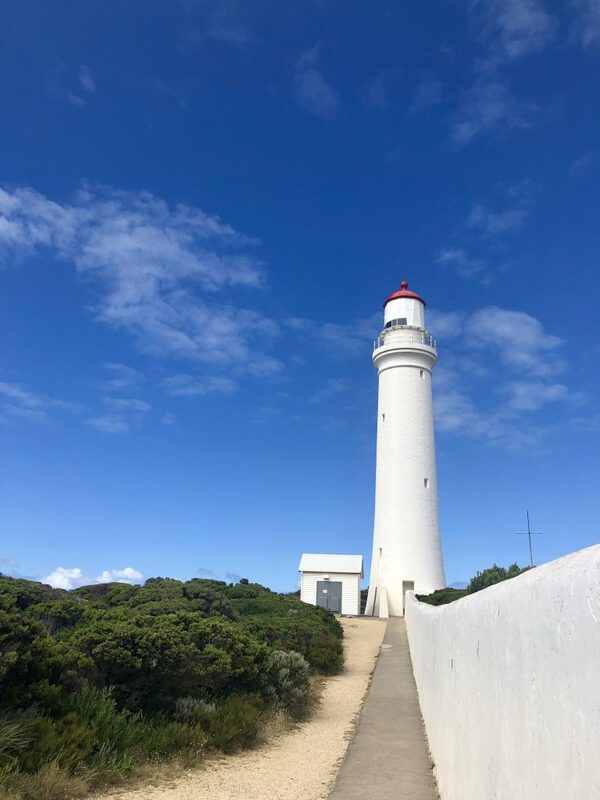 Portland is a coastal gem that houses the Cape Bridgewater Blowholes and Cape Nelson. In addition, you have to go on a seal watching tour in Portland. Seals by Sea Tours offers a fantastic deal. As of right now, the price is $40 AUD per person for a 45-minute tour. 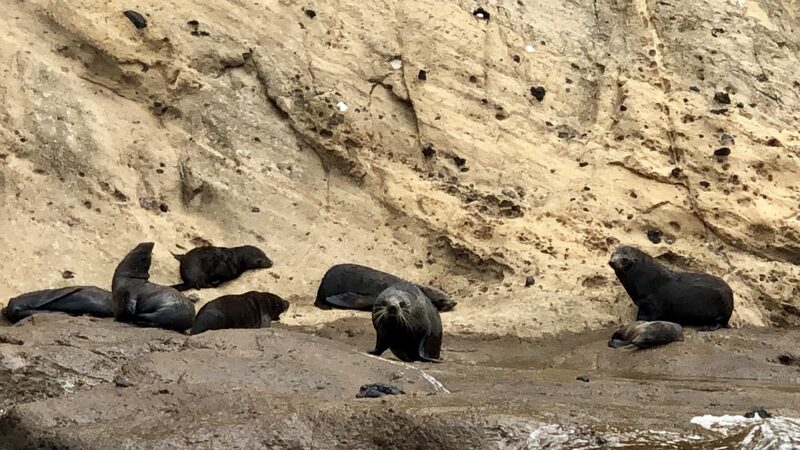 We saw hundreds of seals and had the best time. Should you decide to do this, make a reservation in advance. The boat only holds ten people and it fills up fast. I may or may not have tried to jump into the ocean to snuggle a seal. View of the ocean from the lighthouse. Lorne is a popular town along the Great Ocean Road that’s filled with shops and restaurants. It also has several accommodation options that are suitable for almost all budgets. You can find high-end hotels and caravan parks. Grab an ice cream cone at Lorne Ice Cream and stroll along the beach as you indulge in this heavenly treat. If you’re indecisive on flavors like I am, try the chocolate banana. I could write an entire post on how delicious that flavor is, but I’ll stop for now. Side note—do you guys think I should start a blog about ice cream? After you’re done devouring your ice cream, head over to Teddy’s Lookout. 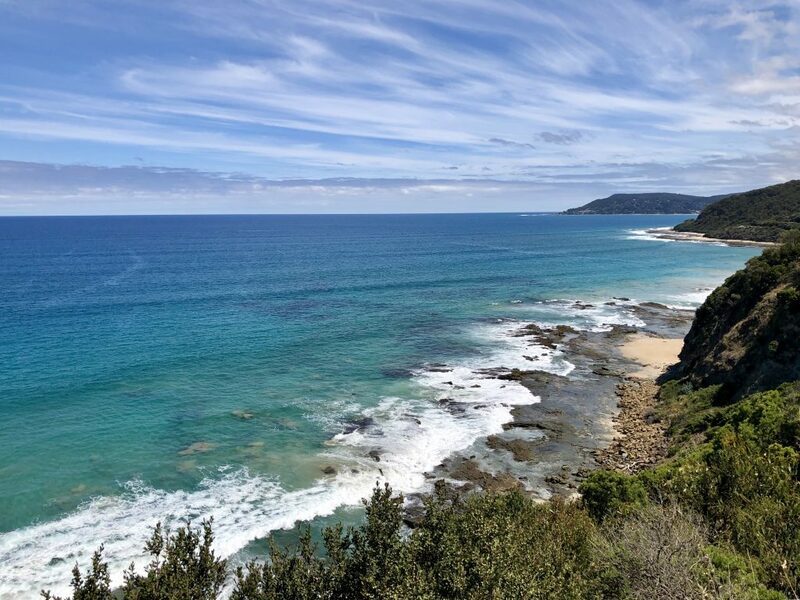 It’s only a few minutes drive from Lorne. Be prepared to have your mind blown! The walkway takes you to a viewing platform where you’ll be left in awe. If you’re into surfing, this is a fun and ideal spot for you to do it. There are so many surf breaks along the coastline. Bells Beach is also around the corner, which is where the Ripcurl Pro World Surf League happens every year. If you’re not into surfing—don’t worry. You can hang out at the beaches and watch other talented surfers do their thing. Either way, you won’t be disappointed with stopping here. Basically, drive from Melbourne to Portland. The ocean will be on your side (for my Americans.. I typed this sentence and got the Nationwide Insurance jingle stuck in my head) and you will have a better view of the coastline. You can also pull over easier when you want to stop. I’m sure you’ve heard the phrase, “early bird gets the worm.” If you haven’t, you’re probably living under a rock. In this case, the early bird gets solitude. I know I can’t be the only one who has to mentally prepare for the possibility of huge crowds. I’m a snap-happy kinda gal and I know that a lot of you are too even if you don’t want to admit it. The best way to avoid this is by visiting the sights right at sunrise. Not only will you catch the pretty sunrise, but you’ll also have some peace and quiet. Not trying to sound like your momma here, but bring a jacket. You’ll thank me later. It was hot in Melbourne so I figured the weather would be similar along the Great Ocean Road. I was so wrong. The breeze was quite chilly. 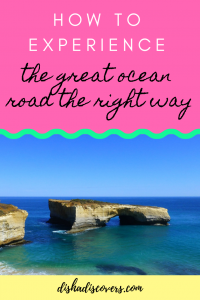 Have you road-tripped along the Great Ocean Road? If so, do you have any additional tips? Let me know in the comments below. I hope you found these tips helpful. Don’t forget to pin this post for later! Aww, proud Aussie right here, absolutely loving this post! 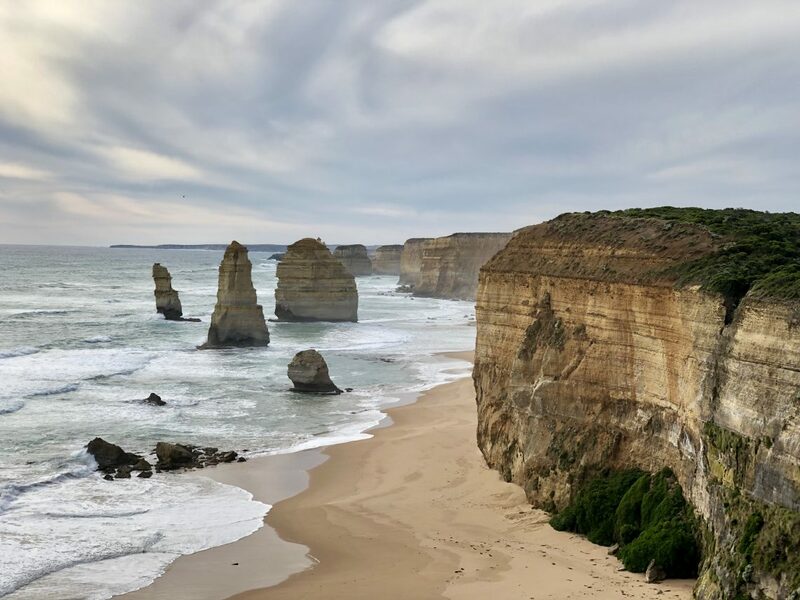 Your photos are so beautiful, and it makes me realise it has been too long since I was last on the Great Ocean Road! AWWW!!! It means so much to me that an Aussie loves this post!! YAY!! Thank you for reading! I would absolutely love a trip like this! I love the seals… so cute! I went to California once and saw seals in the ocean for the first time. What a wonderful experience. I love that you saw seals in the ocean too! Isn’t it so magical? Thank you for reading! 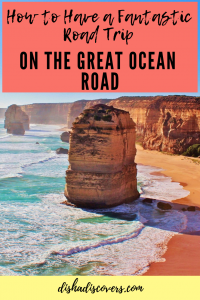 I had never heard of the Great Ocean Road until I read your blog post! Seems like a great experience and trip worth taking… I am from California and would love to do a road trip along the coastal highway here as well. Thanks! I want to road trip along the coastal highway there too! It looks beautiful. Thank you for reading! Wow! My favorite road trip of all time was when The Dude and I drove from Cairns to Sydney. We took our time — three weeks — and just sort of stopped where we wanted, drove when we felt like it. Fantastic. Of course, this was back in the early 80s, when that sort of thing was possible, as well as fun. Thank you for bringing back happy memories, and making me want to go on another Aussie Road Adventure! We’re actually road tripping right now from Melbourne to Cairns and then Sydney. It’s so fun to take your time and stop wherever you want. Thank you for reading! These pictures are gorgeous 😍😍 Love this guide! I’ve never heard of this drive but it sounds AMAZING. What a beautiful drive that must be! I doubt I’ll ever get to Australia, but if I do, this road trip is on my bucket list. Thank you for reading! If you happen to visit Australia, please don’t miss it! How beautiful! I only hope I get to one day travel here! 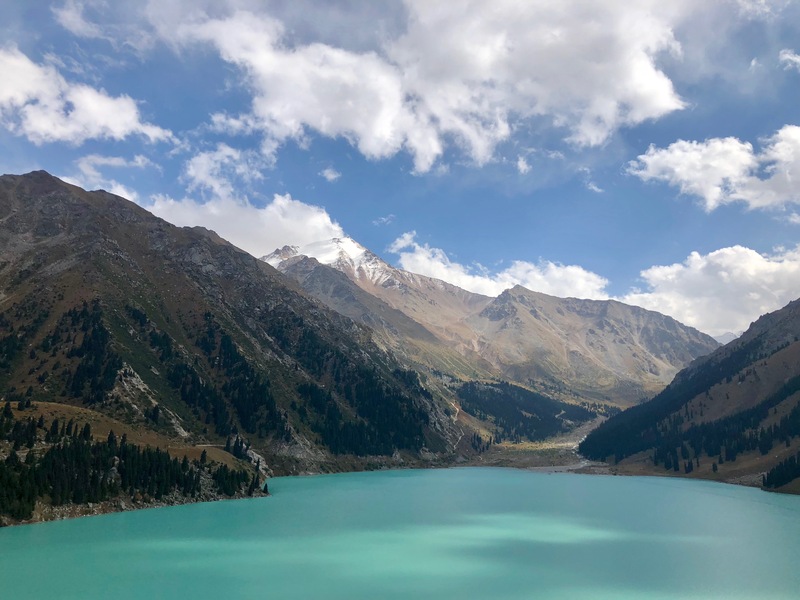 I love this blog post, and the top tips could work well for any traveling trip! Thank you. Disha! You did it again! Another great adventure and awesome photos too! Makes me and my wife want to fallow you around so we don’t miss out on the beauty our world has to offer! Thank you so much!! Come on! I would love to wander the globe with you two! Thank you for reading! I hope you make it to Australia soon. Let me know if you need help or advice when planning your trip. I’m happy to help.